We are delighted to announce our beloved UberTheme.com is launched today. UberTheme is the new face of JoomlArt Magento Themes Club. 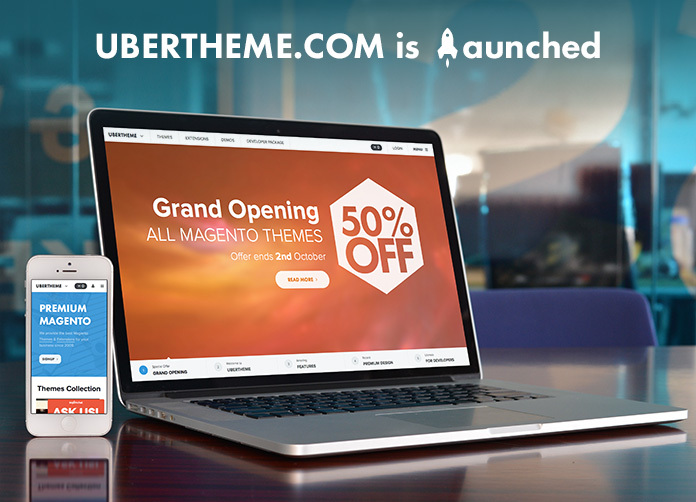 UberTheme is born with the mission of becoming the most professional Magento themes and extensions provider. Parting from JoomlArt, our new born baby will keep pace with the rapid growing Magento community by building a dedicated team around the design, functionality, basic knowledge and tips for Magento eCommerce. And an exclusive discount from UberTheme.com "50% OFF on all items"
It's just a glimpse of the new born UberTheme.com, please head to UberTheme and tell us your feedback on our newest member. Read more on 'How this change affects our current member' .